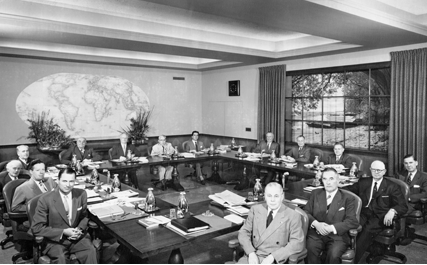 The 1955-56 Board of Directors. Clockwise from bottom left: Dan Procter, Kenneth G. Partridge, Spencer J. Hollands, Alejandro Garreton Silva, Alphonse Fievez, Allin Winston Dakin, Joseph A. Abey, Ernesto Imbassahy de Mello, O.D.A. Oberg, A.Z. Baker, George R. Means, Roy D. Hickman, W.B. Todd, C.P.H. Teenstra, Herbert J. Taylor. Engaging the Hamilton community to enable children and youth, locally and internationally, to reach their full potential.